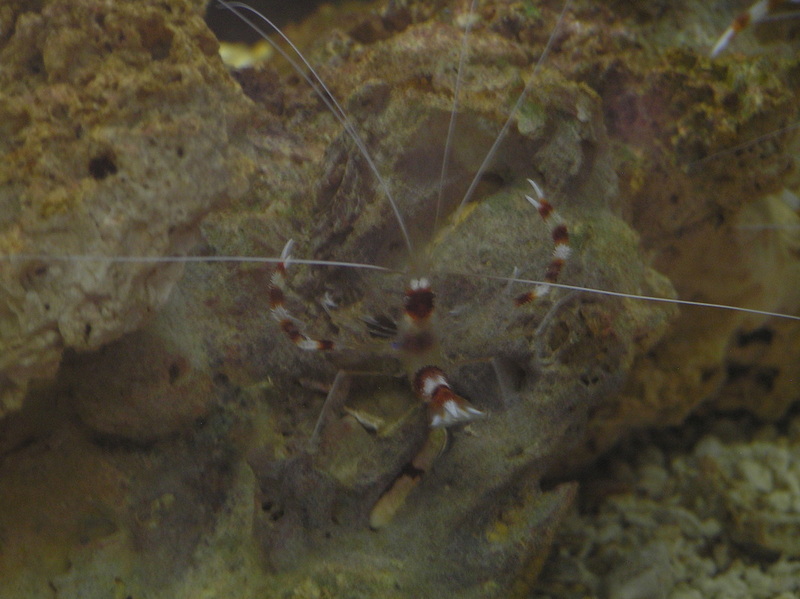 The Banded Coral Shrimp is a red and white banded marine shrimp that can grow up to 6.2cm. They have two pairs of long, white antennae that are very thin and often longer than the body. The 4 pairs of walking legs are thin and often appear translucent. The front pair of legs have developed into large claws that can break off and regenerate if the Coral Shrimp is grabbed by a potential predator. To sense their environment, Banded Coral Shrimp have setae and sensilla all over their bodies along with simple compound eyes. Males and females pair off to mate and go through a courtship ritual when the male individual is equal or larger in size compared to the female. Eggs hatch within 16 days of being fertilized and go through 9 larval stages before becoming adults. Banded Coral Shrimp consume parasites, injured tissue and food particles that they clean from other coral reef fish species. Banded Coral Shrimp can be found in a variety of reef habitats ranging from 2-210 meters below the surface. They inhabit the tropical waters throughout the Indo-Pacific region and western Atlantic region. Other than being part of a balanced coral reef ecosystem that humans depend on, the Banded Coral Shrimp is also a popular species imported for use in the marine aquarium trade. Sanderson, Kristen. "Stenopus hispidus redbanded coral shrimp". Animal Diversity Web. Retrieved from: http://animaldiversity.ummz.umich.edu/accounts/Stenopus_hispidus/.